Although relatively unknown in the classical concert life of today, the viola da gamba was highly esteemed at courts during the 16th and 17th centuries. Learning to play the viola da gamba was an essential part of a noble education. Our hearts still beat faster, after centuries, for this profound, sonorous instrument, which is also very capable of modulation. 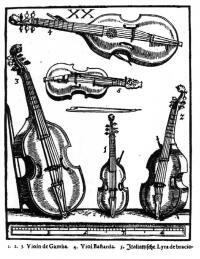 The viola da gamba (Italian for “knee violin”) probably originated in 16th-century Spain. Towards the end of the 16th century, this instrument was found at certain courts in Italy that maintained close connections with Spain. As a melody instrument as well as a chord-instrument, it is close to the lute and vihuela in its development. With either six or seven strings, the instrument was soon built in “families”. Whereas England cultivated the viola da gamba consort until the end of the 17th century, soloistic music for the bass viola da gamba was at the foreground in France and Germany during the early Baroque period.